Over 50 immigration detainees began to refuse food this morning at the maximum security Central East Correctional Centre in Lindsay, and the Toronto East Detention Centre in Scarborough calling for an end to indefinite detentions in maximum security prisons and protesting prison conditions that include lock-downs and solitary confinement. 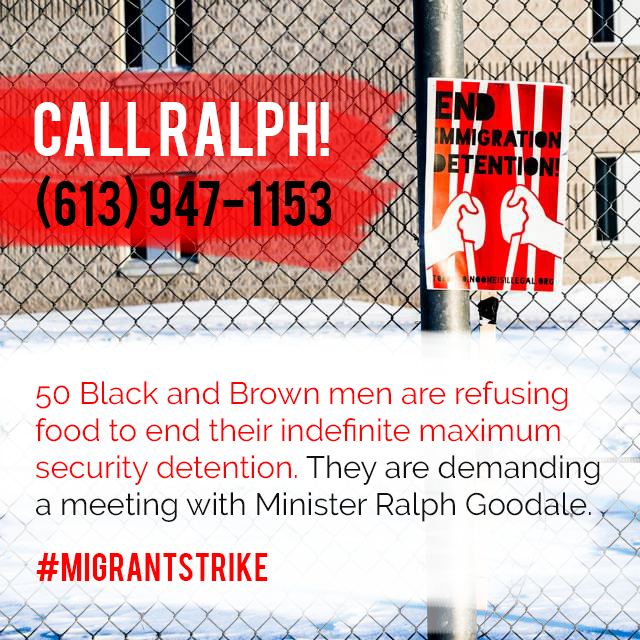 The immigration detainees are asking for a meeting with Public Safety Minister Ralph Goodale to discuss their concerns. Please help amplify their message! Click here for ongoing updates! Canada is one of the only countries in the world that does not have a limit on length of detentions. As a result, immigrants are imprisoned for indefinite lengths of time, without a charge, a trial or a release date. Most recently, immigration detainees went on a hunger strike beginning April 21, 2016. Officials from Canada Border Services Agency (CBSA) met with them, but have not followed through on the promises they made. Immigration detainees have now re-initiated their hunger strike, and are calling for a meeting with elected officials. “The Ontario and Canadian Human Rights Commission, lawyers and doctors, even the United Nations have all insisted that detentions should be the last resort, for the shortest time possible, and not in maximum-security jails. Why is Canada being a rogue nation, jailing people where they are dying?” added Khan. We will be releasing daily updates as the strike progress, follow #MigrantStrike on social media channels, and www.endimmigrationdetention.com for more.